And now for a little diversion. My DH and DS went to an airshow over the weekend, leaving me home alone with my art supplies. I spent a lot of time on the torch, since I haven't been out there much over the last year. I got to try out a lot of experiments from my idea stash. The foremost was to make a glass ring to keep up with the Ring a Week challenge. Several weeks ago, I bought a large round mandrel that I thought would be big enough for a ring. 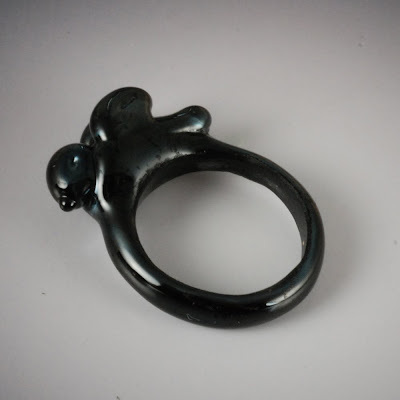 My idea was to sculpt a bird ring, similar to the bird rings I carve out of bronze. Glass, of course, is a different beast. But this was the first experiment. The hardest part was to get the glass (semi)evenly deposited onto the mandrel in a ring. I decided I needed to work right at the end of the mandrel, where I had the edge to guide me, rather than in the middle of mandrel, where my wrap didn't exactly meet up -- that was a seriously jogged first ring! This first effort is rather simplistic, but it shows that I can make it work. I ground out the inside of the ring to remove any sharp edges. It fits quite well on my size 8 forefinger. How sturdy it is? That is the question. I guess I need to wear it around some to see how it takes knocks. I made the bird fairly stocky to avoid weak glass points on the beak, wings and tail. Since I only have the one mandrel this size, it's a one ring at a time experiment. Next round, I'll get a bit more elaborate. This ring is amazing Vickie !! Vickie, the ring is so very cool. I want one.